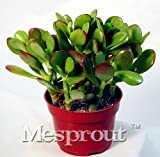 Jade plant for sale is a rooted cutting from the mother plant. 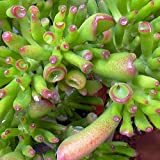 Jade plant is a low maintenance indoor succulent plant and easy to grow and propagate. The two most important factors to consider in growing a jade plant are water and light. When jade plants get enough sunlight, the stem of the plant will grow thick start to look woody. Also, the leaf tips of the jade plant will turn red, making these plants even more beautiful. If you plan to keep it as an indoor plant, it is recommended to use a clay pot. Clay pots will help to wick the water out of the soil, allowing it to dry out faster and lowering the chance of over watering. Location – For best results, your jade plant should be grown in very bright sunlight and low humidity. 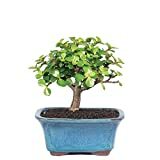 Jade plants need full sun in order to grow properly or else they may become stunted and leggy. Jade plants need a lot of light in order to grow strong and thick. They prefer an environment with temperatures between 55 degrees Fahrenheit at night and 75 – 80 degrees Fahrenheit during the day. However, they will tolerate temperatures down to 40°F. Soil – The optimum soil pH for growing Jade Plants is 6.5. It is best to use a lightweight and quick draining succulent soil. You can make your own succulent soil by using a light mix of coarse play sand, potting soil and perlite. Water – Never let a jade plant dry out completely. During the spring and summer months keep the soil slightly moist. Water liberally once a week, and then allow the potting mix to dry out completely before watering again. They do not like to be over watered. Consistent over watering will kill them. Fertilizer – Feed you jade plant once every 6 months with a balanced water soluble fertilizer. Do not fertilize when the soil is dry as this will damage the roots. Water it first, and then give it some liquid fertilizer. Also avoid fertilizing them during the fall and winter, they go into a dormant state during the winter and you don’t want to force new growth. Pruning – Pruning the leaves of jade plants will keep the plant compact, and allow the stem to grow thicker. Pinch off new growth or prune off leggy growth to encourage the plant to grow fuller and thicker. If you want to use the cuttings to propagate, you may do so. Most of the people are unaware of this: your jade plant can produce flowers. The trick is to expose it to cooler temperatures, allow the soil to dry out, and make sure it gets tons of light. You may leave your jade plant outside until right before the first frost in the fall. Then bring it indoors, place it in a sunny spot and allow the soil to dry out.